With just two legs remaining in the Volvo Ocean Race the battle for the overall prize is tighter than ever, with three teams fighting for first place and a fourth crew still in with a shot at the podium. As the team’s prepare for the Sunday afternoon start of Leg 10 sprint from Cardiff, Wales to Gothenburg, Sweden, Charles Caudrelier’s Donbgfeng Race Team has the advantage, sitting in pole position. The Chinese-flagged team holds a one point lead over Xabi Fernández’s MAPFRE, who had been leading for the majority of the race. And just two points further back is the hottest team in the race, Bouwe Bekking’s Team Brunel. To put in context how dominant Bekking’s team has been over the past three legs, consider Brunel has scored 37 of the maximum 38 points available, compared to Dongfeng with 26 points and MAPFRE who have collected 20 points over that span. As much as he’ll be fighting for the prize, Bekking will need to keep one eye on his Dutch compatriots on team AkzoNobel, who could challenge for the podium with two strong results on the finishing legs. For the leader, Charles Caudrelier, the emergence of Brunel as a threat has changed the way his team will approach Leg 10. 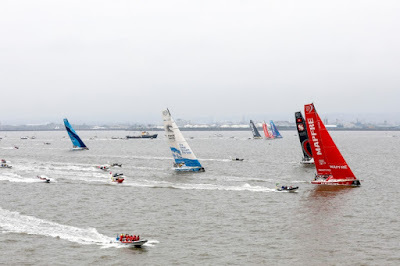 Leg 10 is a 1,300-nautical mile sprint that takes the teams around the west coast of Ireland up to the northern tip of Scotland before heading east-southeast to Gothenburg, the home of Volvo.